If you are planning to start your own Do It Yourself (DIY) electric car conversion project, you need to head over to the golf course. No, I am not suggesting you play a round of golf there, but rather, head over to the golf carts service station. Like any admirer of the game of golf; you too are sure to be acquainted with the expensive batteries that are required to power your homemade electric vehicle. However, if you think that you can simply pick up the used batteries, recharge them and use again, you are in for an unpleasant surprise and will find that the job is not that simple. After you are through with these, the costly replacement of the exhausted and inefficient batteries is going to put a strain on your purse. But everything is not lost and you can take some necessary steps to make the second hand golf cart batteries work more effectively and serve you for a considerable length of time on your EV. The first and foremost thing to consider is how the old golf cart batteries were maintained which will determine their life span and will eventually help you to not only cut down your expenses on replacement batteries but will also help your DIY electric vehicle runs efficiently. Remember to check the batteries and ensure that there are no leakages. If you find the batteries are damaged, take necessary steps, which will not will give a longer life span to these but will also provide optimum power to your EV and cater to your entire satisfaction. 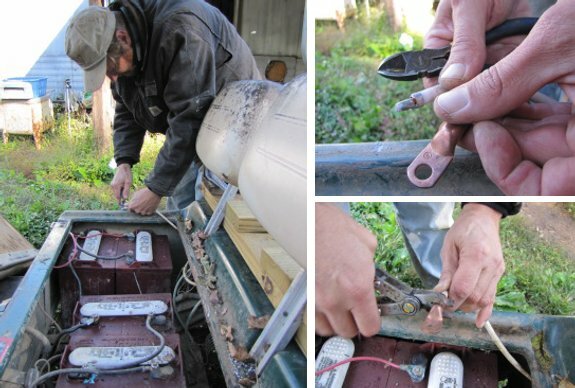 You should regularly check for any cracks and defects with the batteries as well as the terminals. After you have setup the batteries on your electric car, you should make the cleaning of the terminals an integral part of your maintenance routine and ensure that these are free of dust, dirt and water to prevent corrosion. However, to avoid any health hazard you must adopt the necessary precautionary measures while performing your maintenance routine. This is of utmost importance since direct contact with acid batteries can harm your skin. To remain safe, you should always use distilled or de-ionized water for maintenance and cleaning purpose. Do not forget to check the manufacturer’s maintenance instructions of the batteries, which will lead to a longer life span of your batteries and bring down your replacement expenditure. Acquaint yourself with the tried and tested measures of cleaning your electric vehicle power source, since this will ensure that your batteries work properly and also last longer. Follow the recommended maintenance routine and while performing this, ensure that the vent caps are tightly fitted. Always use the recommended equipment and tools for maintenance and cleaning. You should also be mindful of the fact that proper charging of the batteries will ensure their optimum performance. You need to exhaust the batteries before charging and should always fully charge these; however, keep a keen eye and ensure that the batteries do not get over charged, since this will harm the batteries. Last but not the least, filling your batteries with water up to the right level is a very important function that will ensure proper functioning of these over a long period and hence, as soon as the plates get covered stop filling water to your batteries. If you follow these simple steps and the recommended maintenance schedule, you can ensure extended life span for the batteries on your custom made electric car, thereby reducing the necessity of early replacement of these and the associate cost, too.